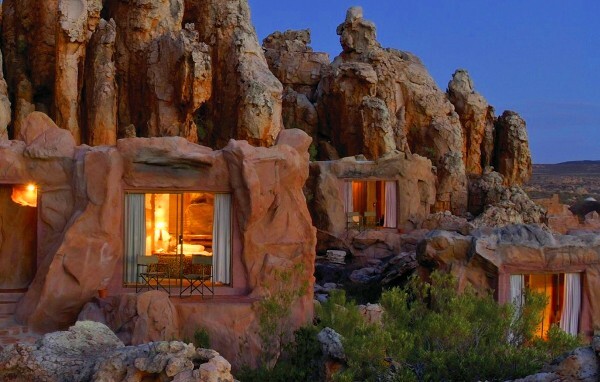 Add on a tour in South Africa to a luxury retreat nestled in the scenic Cederberg Mountains. Enjoy the breathtaking views and the magic of this unspoilt paradise. The region of Cederberg is a short drive of 2 hours from Cape Town and well known for spectacular rock formations and ancient rock art sites. Home to the Bushmen for centuries , the cave paintings date back to 6000 years, and give an insight into their every-day life as well as spiritual beliefs. This is a fascinating excursion, one that will leave you in wonder of the rich heritage. Excursions at Kagga Kamma Cave Resort include guided 4×4 and quad bike safaris, hiking trails on the Cederberg mountain range and nature reserves, swimming in rock pools and star gazing tours at the mini Observatory. The wonders of the sky will be a thrilling experience as you view planets, satellites and stars up close through telescopes guided by an expert. You can also relax at the resort’s swimming pool whilst admiring the rock formations built around the area, and rejuvenate at the Spa with its exclusive treatments. The Kagga Kamma Cave Resort will entice you with stunning scenery in tranquil settings with a range of exclusive tours and activities. It is a magical place and well worth a visit. The Resort has a variety of accommodation including the ensuite Cave Suites which are built into the rock formations, and luxurious Rondavels. The most unique is the Open Air Room where you can sleep under the stars with all the comforts of a luxury suite. This luxurious and romantic setting is ideal for honeymooners and for couples wishing to experience the romance under a star-filled sky. A visit to Kagga Kamma Nature Reserve is a perfect add-on to any tour in South Africa.